How to socialize our app when social media is breaching trust? What we do after developing an app? We share the big news with our audience, request them to use our app and if possible give their useful feedback. We also request them to share their contact details. No doubt, this is a big ask. But, we need it to reach out to them later with better offerings, and a much developed product. Let’s accept Facebook and other social media have been very successful to be the go-to platform for such meeting and conversation. After the terrible Facebook Cambridge Analytica scam, scepticism and apathy are brewing in the minds of the social media users. This is huge loss for all of them who has bet on social media to introduce their app to targeted audience. Now, when odds are against Facebook and others social media, how will the business have connection, communication or traction? The makeover has already started. Zuckerberg is apologetic and others in the tribe are trying to polish their avatars. We pray this will be enough. We wish that would change the scenario and earn the trust. But, the scar, fear and doubt are already here. So, what will you do after developing an app? Where will you connect to people (for validation or feedback) when they are not trusting the platform? Who is to be blamed for all? Us and certainly not Zuckerberg. He has just made us over-dependent on facebook and such platforms. These platforms give us power, comfort and leisure. We happily dance to it’s tune and never try to explore other way-outs to socialize or reach out to people with our message or application. Result was a worldwide phenomenon i.e if you have to cater more users for your application, social media is the best option. As if there was never an alternative! “A common misconception about marketing at a startup is that it means doing things like: signing up on Product Hunt, writing some blog posts about what’s wrong with the industry you’re in, cold- blasting a bunch of journalists with a press release and then hoping for the best. Now the playbook is even more complicated where few chapters have lost their relevance and resonance (Think about Facebook here again). How did Intercom move forward? So, here is a really soul-searching question for all the app developers. The common belief will tell you to go social media to tell people about your app. It’s the trend now and who does not love the comfort and convenience of social media. Here, the debate is not on choosing “A” platform over “B” platform or going door to door with your application shutting down your Facebook or Instagram profiles. The debate is on believing that still there is a hope, way of communication and a life beyond the social media. Question is are we willing to accept that and take steps ? To be honest, Basecamp can live without even marketing, at least the popular model of marketing. At Basecamp, there is no marketing department. 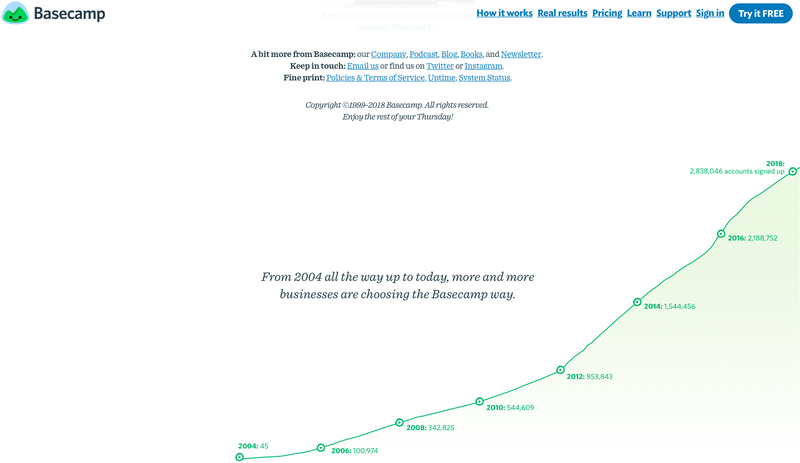 And when we visit Basecamp website, they greet us with users’ numbers growing every year. Now this envious number of users (and revenues) have been achieved without all the buzzwords- SEO, Social Media Marketing and etc etc..
How they made it possible? Would it be awesome ( double or quadruple sales) if they do social media marketing? When questions come on socializing (reaching out to more people) with your application, Jason Fried was doing it right without chasing social media marketing. Today, if Facebook shuts down, we think Jason can easily survive as he has not really fancy his business on Facebook or any such platform per se. The Basecamp is not leveraging any such marketing strategies but they are doing wonders with their belief in one common secret. We understand, it’s not easy to suddenly stop doing social media marketing. At the end of the day, your app needs audience (users) to be successful. Social media has been faithful here. But, there is a dent now. We think, let’s accept the fact and think ahead. How will your business connect to the audience if they stop coming to social media? What will be the alternative way? We believe there is an alternative way or multiple options which will help all business including you and us to sustain and grow. We think, it’s time to move over Facebook rant, find out the alternative and do the basic i.e build the best app for your audience. Isn’t it best to do where you have complete authority! You can come up with useful ideas and build some wonderful application. And who does not know, good products sell themselves! We have seen it happen before our naked eyes. Talking about eyes, you must keep them wide open. It’s nice to have a warm conversation with your app users. But, there are other meetups and conversations too. Where your users talk about your app among them! Are you listening to them? Are you attending those parties? Is it a big ask? Well, a good application/product will do the job for you. It’s better you and we concentrate on that. Always there will be a channel for communication, connection and conversation. If not facebook, something else. But the question is, what they will talk about? Will it be your application or business? We would love to trust you here! We are a team of developers and designers at heart and certainly not marketing wizards (but we love to talk to people!). Consider this post as an open letter to all business where we are opening up our hearts at the backdrop of recent events. 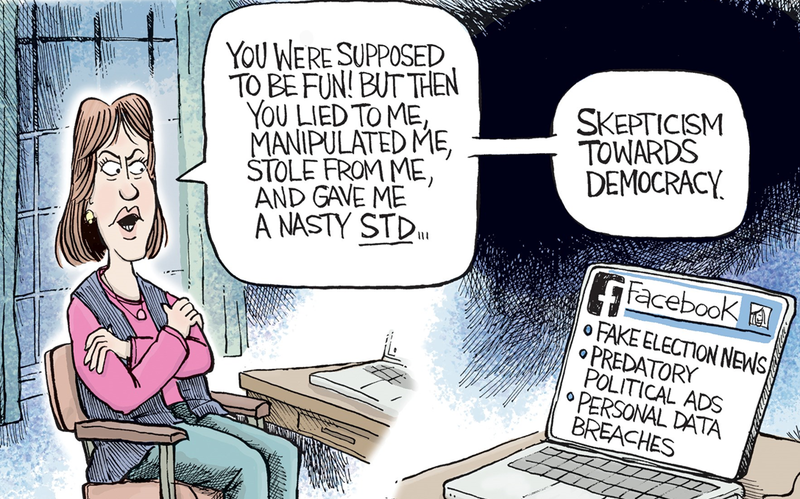 Do you feel the threat or you still consider Facebook and other social media platforms as viable playgrounds? We would love to know. Would you love to tell us? Tributes to the spirit, disruption, brilliance and impact of the startups and entrepreneurs.